Closed: Memorial Day, Independence Day, Labor Day, Thanksgiving, Christmas Eve, Christmas Day, New Year's Eve and New Year’s Day. This tour is free for Trust members! 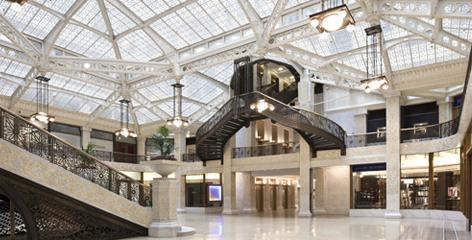 For member reservations: Visit our museum shops or call the ticket sales line at 312.994.4000 ext. 1. The ticket sales line is available 7 days a week 9 am – 5 pm CT.
Rookery tours are wheelchair accessible. “Will Call” Ticket Holders – Check in and pick up your tickets at the ShopWright store (in The Rookery lobby) no later than 15 minutes prior to your specified tour or event time. “eTicket” Holders – Bring your eTickets with you and check in at the ShopWright store (in The Rookery lobby) no later than 15 minutes prior to your specified tour or event time. eTickets must be exchanged for authorized admission tickets before the tour or event. Late arrivals will join their specified tour or event in progress. For certain special programs and events, you may be placed on a guest list rather than receive a ticket. Ticket purchases or reservations entitle the Frank Lloyd Wright Trust to unrestricted use of photographs taken by our staff or agents during your visit, without subject consent.